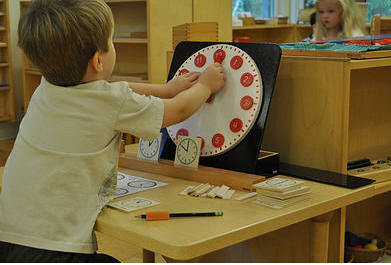 The curriculum and guiding philosophy of iGrow Montessori School is based on the work of Dr. Maria Montessori, an Italian physician who dedicated her life to an educational philosophy based on years of observing children. She wrote curriculum, adapted and created materials, built child-size furnishings, and designed special physical environments. Her conclusion: education must follow the universal laws of human development as revealed in the actual lives of children. In other words, developmentally appropriate education. A Montessori community is a safe place where the dignity and unique possibilities of each member are respected and nurtured. At iGrow, we provide classroom environments where children connect with each other and their guides in the learning process in the classroom and during outside activities. Curriculum materials are designed to be self-correcting so that students may “discover” learning as opposed to having an adult tell them what something means. There are numerous opportunities for children to make educated choices, learn from their mistakes, and repeat and practice activities using their various learning styles. At every opportunity children are empowered for life-long learning by having a sense of ownership of their own work. In the Upper School classrooms, guides (teachers) engage with the children in designing an educational plan that is unique to each child’s individual style and interests while adhering to national standards. Classrooms are multi-age groupings where children learn from their guides, older mentors, their own individual explorations, and have opportunities to teach what they have learned. Montessori classrooms are dynamic and collaborative places where the whole child – mind, body, and spirit – is engaged in developing academic abilities by following personal interests, establishing respect for self and others. This happens through exploration of the environment and relationships, and working within a community to create a better, more peaceful world.